Project Run & Play started again this week! This time I actually found the time to blog between the seasons which has been fun, but I have so been looking forward to this week. This season is All Stars so there is an amazing group of ladies back for more challenging fun. They’ve been sharing sneak peeks over on instagram and I’m dying to see what they each came up with for the first theme: Inspired By Art. I’m originally from Massachusetts, but I went to college in the Northwest and spent about nine years living in or near Seattle, WA afterward. 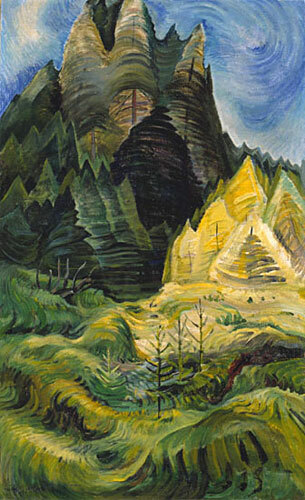 On one of many trips to Vancouver, BC I stumbled upon the works of Emily Carr. I had seen a painting or two of hers before, but there was something about the collection that day that I fell in love with. 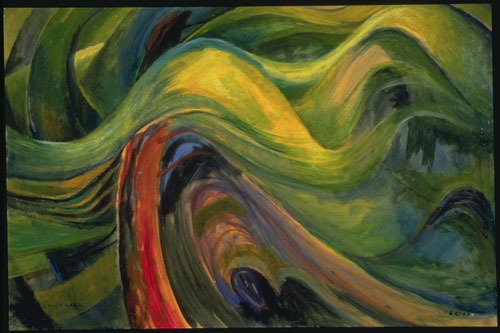 The colors she used and her brush strokes somehow speak to my reasons for staying in Washington so long. It’s difficult to put into words, but isn’t that true of most art that really draws you in? When I first saw the theme for this week, I wasn’t sure I’d sew along. I have a few spring sewing plans and I didn’t think I could squeeze it into an already busy week. Then on Tuesday I found an old post card that I picked up on that Vancouver trip and I knew I had to do something inspired by Emily Carr. Even if it didn’t get completed in time for the Linky party, I felt compelled, hehe. 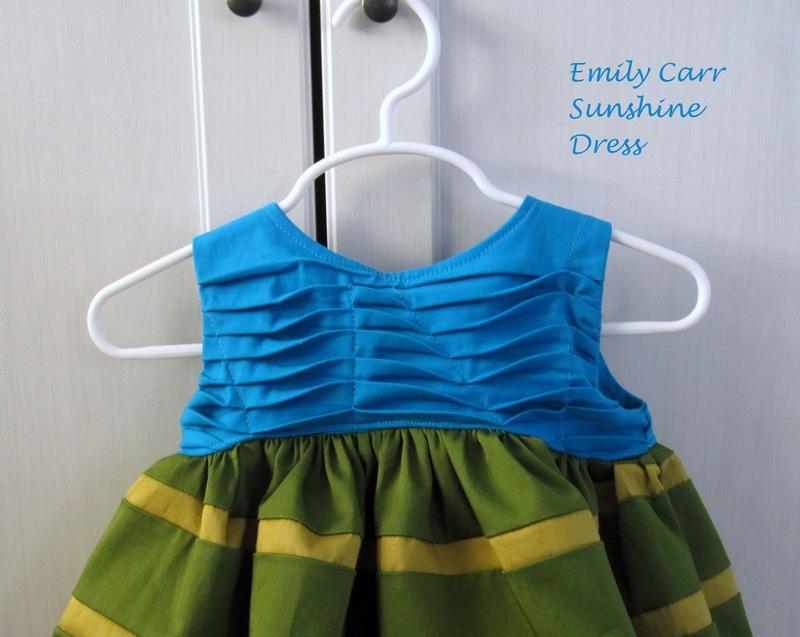 I couldn’t get the pictures of the big billowy trees out of my head and while reading a few blogs that day I realized that the shape of the new Sunshine Dress (affiliate link) might be a perfect match. 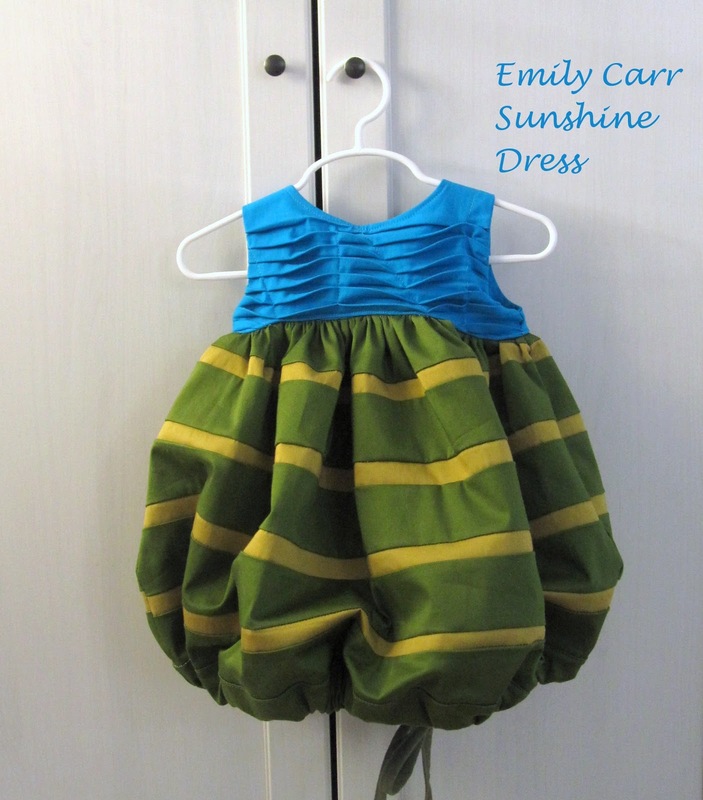 The more I thought about it, the more I knew I had to make an Emily Carr Sunshine dress. I used the same green and blue fabrics I got at JoAnn fabrics years and years ago (while living in Seattle, hehe) that I’ve used for a bunch of outfits for Bean this year. 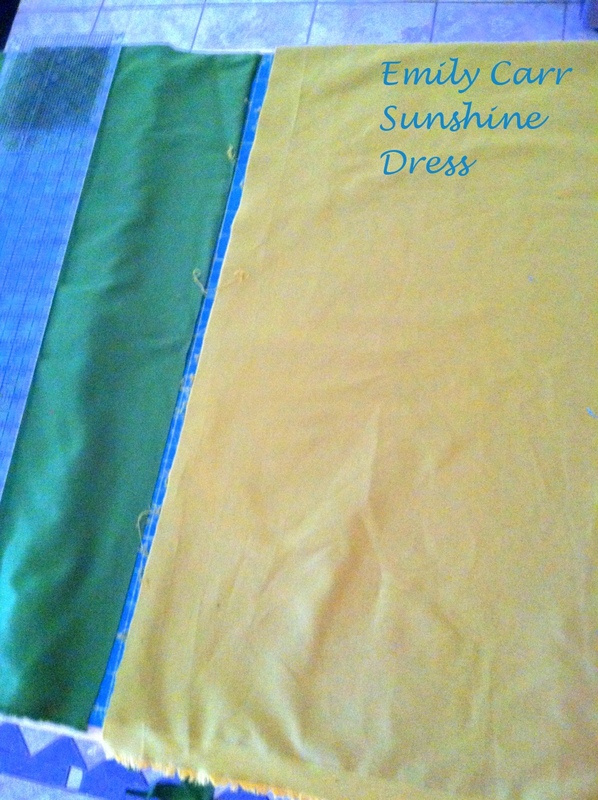 It’s the best fabric; really bright color, a tiny bit of shine, nice thickness, and a bit of stretch. I still have more left even after this project, but I wish I had some in every color. For the bottom skirt portion, I knew I wanted to exaggerate the puffiness to mimic the tree shapes. I also thought strips of different colored greens would look a little like the shading. So I took a piece of the green fabric and used a bleach solution to fade it until it was the color I was looking for. I cannot believe that it came out the exact color I wanted. That never happens, hehe. 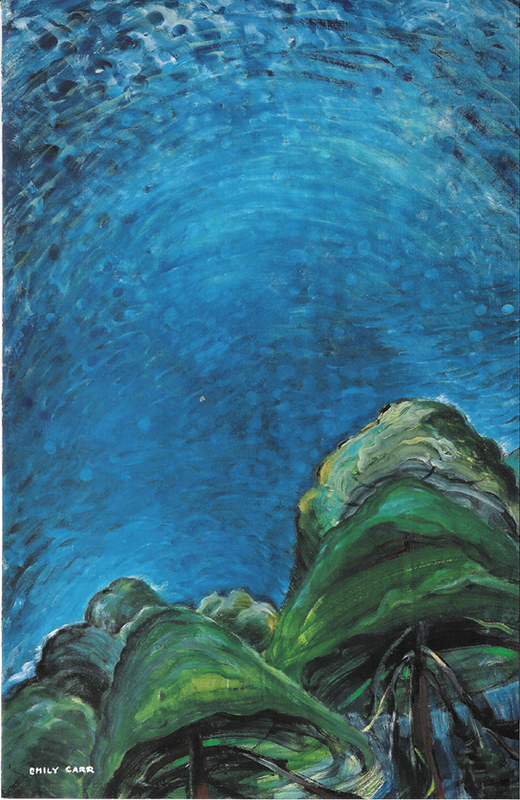 The blue fabric was already the perfect color for the sky – such a rich, dark blue – but I wasn’t sure how to show the brush strokes I so adore in those paintings. Then I remembered I’ve been wanting to play with pleats and their direction. 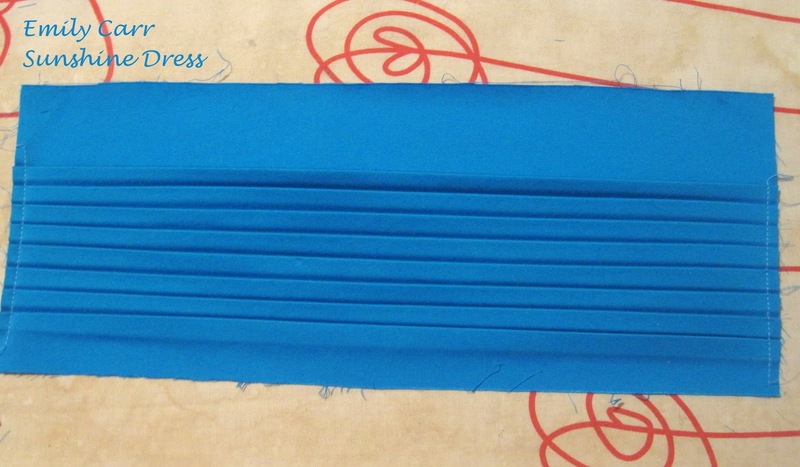 So I made a strip of blue pleats and then stitched up and down and diagonally across them to make it look like they were rolling across the front of the bodice. 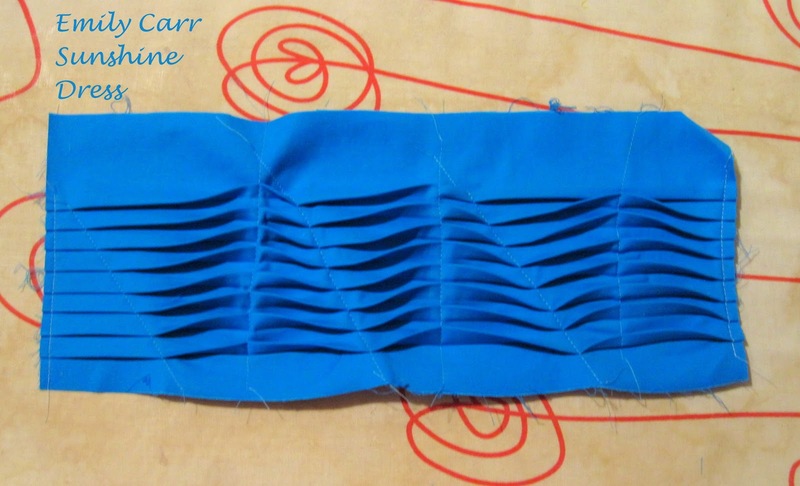 Instead of just cutting out a front bodice shape from the pleated fabric, I decided to trace the outline of the pattern piece on top of a section of the pleats. 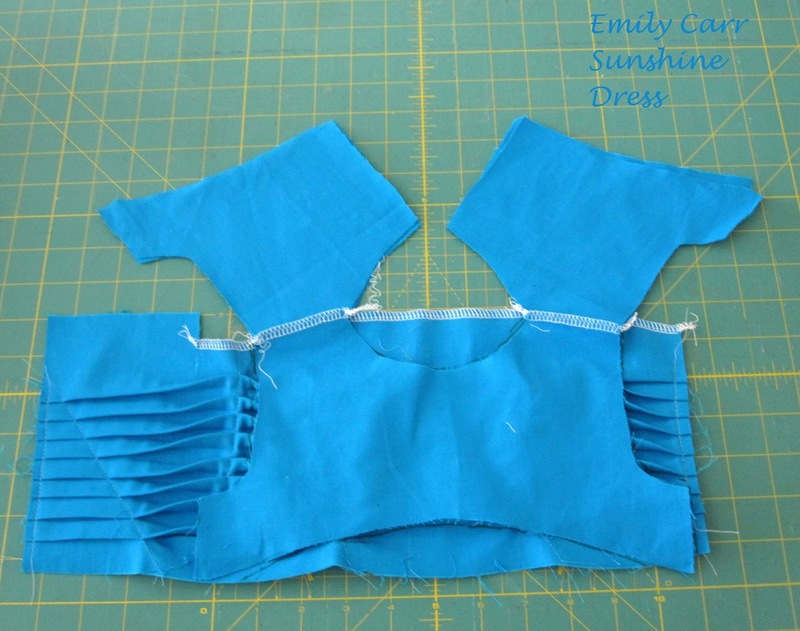 Then I sewed the back shoulder pieces directly to the pleated fabric using the outline as a guide. Once the lining shoulders were also stitched I was able to put the lining over the pleated fabric and stitch the bodice together. I was worried the pleats wouldn’t hold their shape if I just cut the pattern piece out and I found sewing it in place worked well. I finished the back of the dress with some little white buttons just to give a sharp contrast of the white and blue in the back. I also used another color of green fabric to make the tie that cinches the bottom back edge. Yes! Pictures of Bean wearing the dress outside. It’s a little chilly, but there’s hope for spring yet! Your dress is unique and beautiful! Really creative and amazing craftmanship! And the dress is still cute and wearable! You are so creative! You completely captured the spirit of these paintings and made a darling dress at the same time! I love this. It takes elements without being too matchy. I love the bottom. Great job. Love! I've been anxious to see the finished product after seeing what you were doing on instagram. It turned out fantastic! I love the stripes! and what you did with those pleats was a stroke of genius! I especially like the technique for the bodice. enJOYed your post! Thanks for sharing. Found you at Nap Time Crafters. Amazing details!! 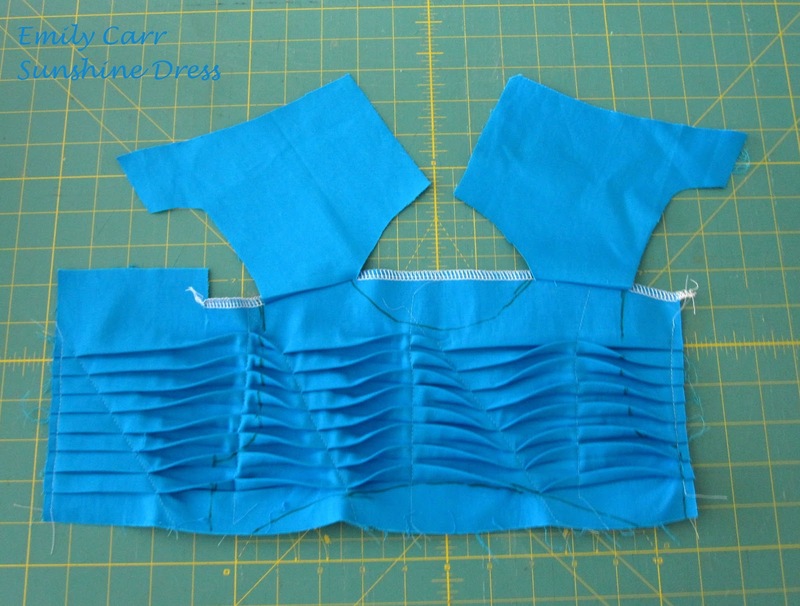 great way to do the bodice to maintain the pleating. Great interpretation of your inspiration piece!!! I hope you are able to sew along next week too! You captured the brush strokes and the 'feeling' of the painting so well! Bravo! Your cutie looks adorable in the dress. Love your interpretation, and the bodice especially! I've been wondering about that dress pattern…how does it look as a full skirt, without the drawstring? 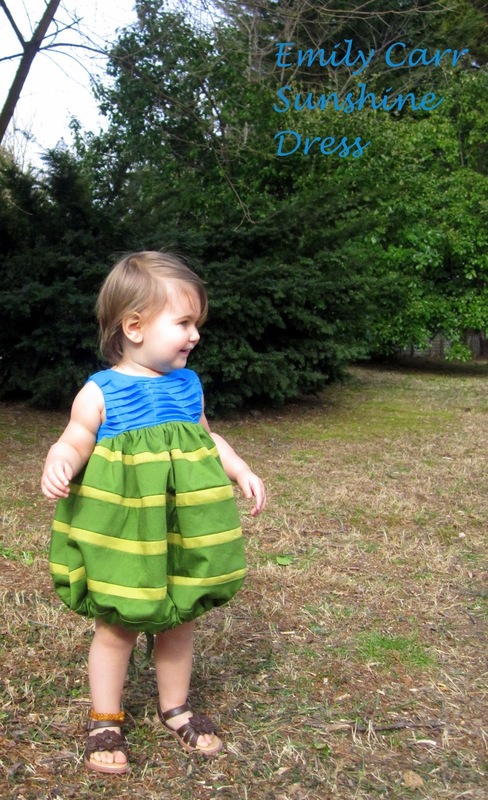 I love the top, and the stripes, but my daughters don't like bubble skirts! Really cute! How great you got to be outside too. What a clever idea! I love how you used the pleats (I've used this technique before and the resulta are always great! 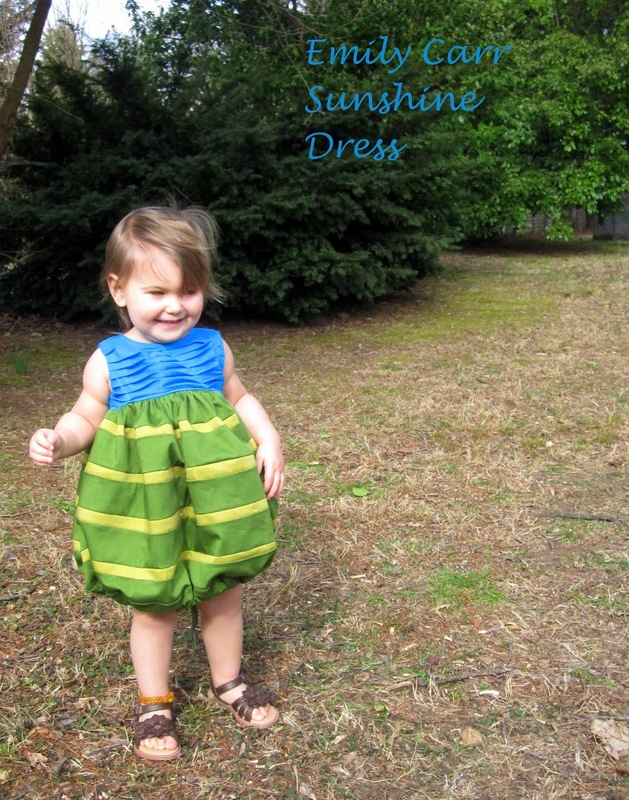 ), and the bubble skirt, is just adorable. Wow, I love your technique on the bodice!!! I've never been able to explain this, even to myself, but I always wanted my prom dress to be a big bubble like that. On a 2 year old, it's really cute. On a 17 year old it would have been absurd. Especially with my red prom dress. I would have looked like a giant cherry and there would have been no end to the jokes all night. Very crafty with the stripes. 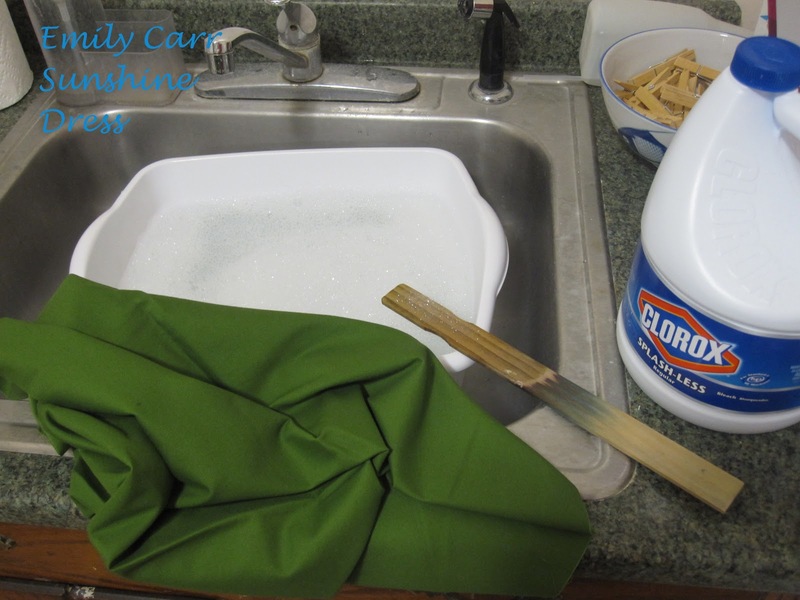 When I saw the picture of the bleach I imagined that you had somehow made perfectly straight stripes with the bleach and I was dying to know how you did it. ps—Your bleaching came out perfectly! 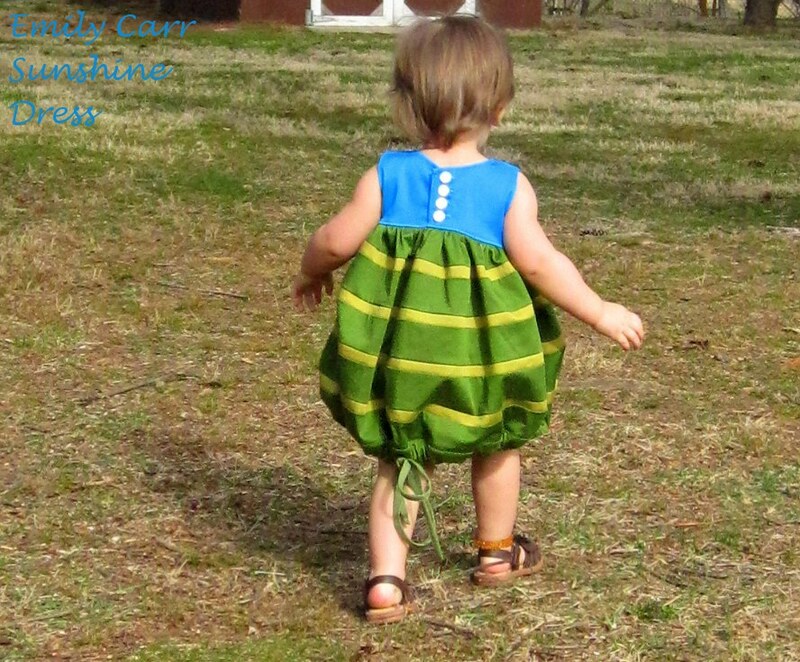 Adorable dress…….Thank you for sharing with the Clever Chicks Blog Hop this week; I hope you’ll join us again! This dress is adorable. 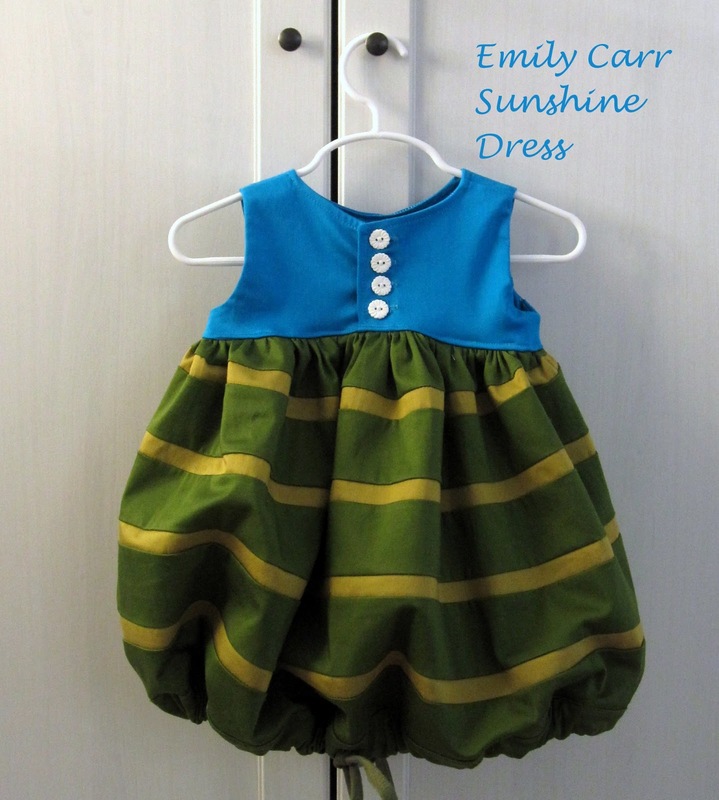 I actually didn't like the sunshine dress pattern when it was released but seeing your version has changed my mind! I love your inspiration and interpretation- not too literal, but I definitly get it. Absolutely adorable!! I love this dress! You're so talented!